Like many other canals in British cities, the Regent's Canal provides an important sanctuary for wildlife. There are two main habitats - the water in the canal itself, and the grass and trees along the banks. Together, they provide a home for a variety of insects, birds and mammals which not only share the space but are interdependent on each other. This activity gives students practice in classification and sampling techniques, and an opportunity to consider the food chains that exist within the habitats. To learn exactly what is meant by a habitat, and to distinguish between natural and man made ones. To develop skills in genus & species identification using keys and charts. To develop fieldwork skills of observation and recording. To introduce the use of the quadrat as a means of ecological sampling. To understand the interdependence of the species in the habitat, and to draw up a food chain or web from their observations. This workshop looks in considerable detail at the growth of the canal network during the 18th century, using the resources available in the Museum - maps of the network, the Coronis, the costume displays, Battlebridge Basin, cargo handling, the life of Carlo Gatti, The displays in the Museum are used as stimuli for analytical thinking about the role of the canals in the Industrial Revolution. To learn about the problems that had to be overcome during the construction of the canals. To learn about the development of the canal network between 1760 and 1835. To investigate what life on board a canal boat was like by looking at the Coronis. To investigate what the life of the canal people was like from the other displays. To investigate how Battlebridge Basin has changed since 1871. To investigate the value of canal posters as historical sources. To investigate different methods of cargo handling. To learn about Carlo Gatti and his role in the ice trade. To investigate the role of the canals in developing Britain's economy. To investigate the development of the Regent's Canal. The London Canal Museum is housed in a building put up over 150 years ago, for a very different purpose from the one it is used for now. 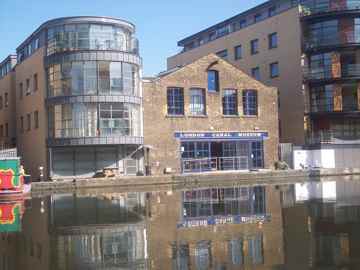 In the drive for regeneration around the Battlebridge Basin, some buildings have, like the London Canal Museum, been adapted and reused. Others have been demolished, and new ones, made out of quite different material, put in their place. This activity looks at the buildings as machines for living and working, and in terms of design. It also examines the differences in materials used to build them. NC KS3 Art & Design Exploring & Developing Ideas 1a & c, Breadth of Study 5 a, b, & d QCA Art & Design Unit 7b Whats In a Building? To understand the original purpose for which the Canal Museum was built, and how this has changed. To look at the ice wells and first floor stables in the building, and consider why they were placed where they were. To examine the windows, doors and other functioning parts of the building and consider why they were built as they were. To compare the materials from which the London Canal Museum was built with the materials of the modern buildings and consider why the changes took place.